One of the most touching gifts a Mother can receive is something special and loving saluting them as a Mother. Receiving a Mom necklace with kids names engraved on them makes the ideal gift for mom for Mother’s day, Christmas, her birthday, or simply to say “I love you”. My Name Necklace specializes in high end personalized jewelry for the entire family. The Silver Mom Necklace With Kid’s Names on it has some nice features that any Mother or even Grandmother is sure to love. While this disc necklace appears simple, it has a casual elegance about it that makes it something that a loving Mother would be proud to wear everyday. This necklace goes well with both casual and office dress. Another great Mom’s necklace by My Name Necklace is the Kid’s Charm Necklace With Love You Mom Heart Pendant. All too often. Mom’s feel unappreciated by their children, and this necklace will serve as a daily reminder to your Mother just how special she is. This is the perfect gifts for kids (even adult kids) to give to Mom for Christmas, Valentines Day, her birthday, or Mother’s day. 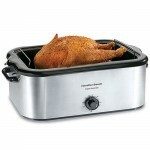 It also makes the perfect “just because” gift for any Mother. This necklace is simple enough for everyday wear, and dressy enough to wear to the office or church. Alma Jewelry offers a wide variety of personalized jewelry of high quality at reasonable prices. This Engraved Kids Charm Necklace With Swarvoski Birthstones has plenty of features that make it a great gift to buy Mom for almost any occasion. This is a lovely Mother’s necklace, with the birthstones for each child adding a bit of bling and color. However, it would be nice if this necklace allowed for more charms to be added for larger families. 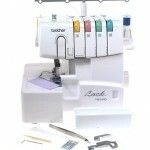 Personalization Mall was founded in 1998 with the goal of making personalized gifts quick and easy. This company allows you to see exactly what your personalized gift will look like before you actually purchase it. 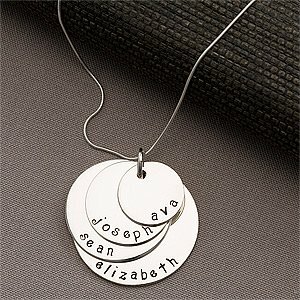 This Personalized Kids Names Sterling Disc Necklace For Mom is great for Mothers with three or four children. This is a simple, yet elegant, mothers necklace for Mothers of 2 to 4 children. The necklace is perfect for daily wear and Mom will wear it proudly wherever she goes. Serenity Is Forever jewelry is inspired by the Serenity prayer that helped the artist Stephanie on her own road to sobriety. Each piece in this collection, is not only a reminder of life’s challenges, but a celebration of life itself. The Mother’s Heart Gift Necklace is a celebration of motherhood and the love between a Mother and her children. There are very few Mother’s necklaces out there that allow for the addition of more than 3 or 4 names, so this Mother’s Heart Necklace, which allows for up to 5 names, is the perfect choice for the slightly larger family. It is a great way to express each child’s love for their Mother. There are also a handful of reviews for this necklace and all the reviews are extremely positive. Central Jewelry Center is a full service jewelry store that offers a wide selection of high end jewelry for those with discriminating tastes. This Personalized Mother’s Pendant Necklace With Custom Engraving has some beautiful features that will make any Mother’s heart swell with pride when she wears it. This is truly an elegant and sophisticated Mother’s pendant, made of heavy 10K white or yellow gold. This necklace will truly be treasured by any Mother, and can be worn for any and every occasion, even those dressy affairs. We would suggest that if you purchase this necklace, you buy a sturdy chain with a good clasp, as this pendant is somewhat expensive, and no Mother is going to want to lose this beautifully crafted piece of jewelry. Having a Mom’s necklace with kids names on it helps keep the children close to a Mother’s heart, no matter how far away or how grown up those children may be. Any one of the necklaces in this selection is almost guaranteed to make a Mother’s heart swell with love and pride and bring tears to her eyes.